Recently I was challenged to consider Colossians 4:12. This passage tells of Epaphras wrestling with God (another way to say “struggling on your behalf in prayer”) for the good of those he loves. Then I thought of wrestling with my boys. This was one of their favorite activities when they were little. If I was in the floor, they were on my back. It was great fun. As we did this, two things happened. First, my boys grew stronger. Wrestling was a time when their muscles were hardened as they got the chance to muster all of the force they could for as long as they could last. Hearing them grunt and strain as they tried to pin me to the ground was a testimony to how hard they were working. No other exercise could have provided a comparable work out. Second, we grew closer. Everything about it was delight. 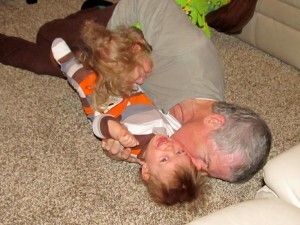 If I smiled and said, “Papa needs a break,” they beamed as if they had conquered me. And they had, but not with the force of their wrestling. I was conquered by my affection for them. There was nothing I enjoyed hearing more than hearing, “Papa, can we wrestle?” It meant our relationship was strong. It meant they enjoyed time with me. It allowed me to show them they had a form of access to me that no one else did. This is not to say there is not a place for combat-imagery for prayer. But we should remember that the person we are aggressively wrestling is not God our Father. We petition our Father to fight these battles on our behalf (Ephesians 6:10-20). Our role is to stand firm (the primary active verb of this passage; Ephesians 6:13). The spiritual strength to do this was created by our wrestling; as was the emotional strength to have confidence that our Father is greater than our present challenge, whatever it may be. The time we’ve spent wrestling with him is meant to embolden our confidence that our Daddy is strong enough to conquer anyone or anything that would come against us. The sweet times of wrestling together is meant to solidify our trust that our Father will use his power for our good. I hope this post reminds you that the power of prayer is not in the eloquence of our request, but in the love and faithfulness of the One you address… as Father.